I am a girl who is always on the lookout for a good upgrade whether it’s a seat on a plane or a designer pair of heels. 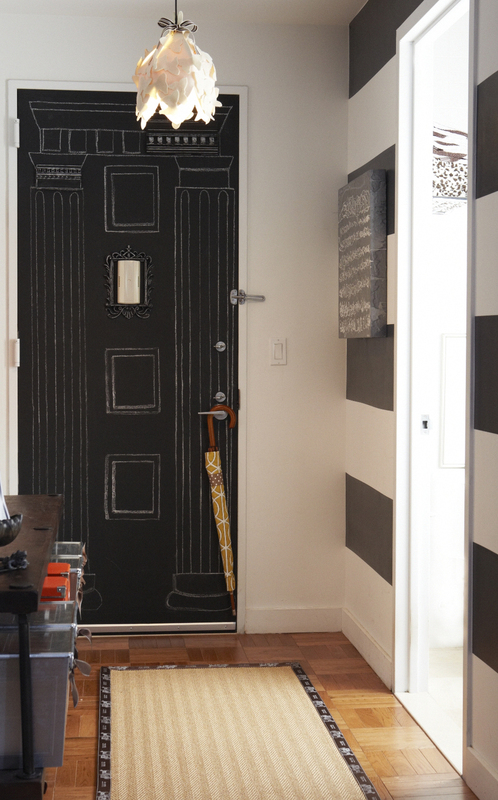 I love the faux chalk door I did last week, but since I was not born with a “super power” to draw beyond stick figures, I looked for a good fake-out. 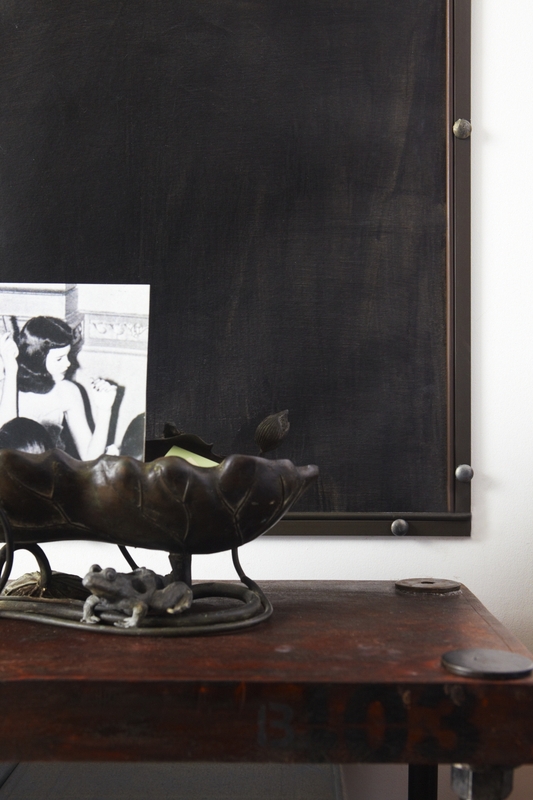 I found this picture frame at Daffy’s in NY (a hit-or-miss discount store in Manhattan), and decided to paint it with the remaining black chalkboard paint. Once dried, I used chalk to outline the scrolls and wonderful swirls the frame had to offer. 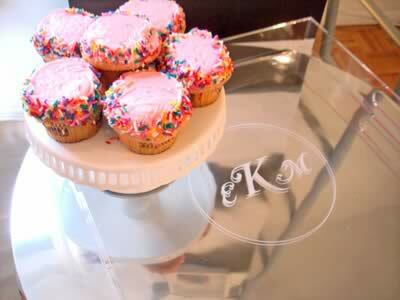 It was an instant hit and so easy! It blends into the door, so it looks as if I drew the scrolls by hand! Because my front door is metal, I glue little magnets to the back of the frame so it’s portable chic. Stay tuned and remember to keep your designs flexible. You never know when a good upgrade might show up at your front door! Give it a whirl!! Even experts at the Color Marketing Group agree that when the Dow Jones takes a dip, people embrace big, bold color. 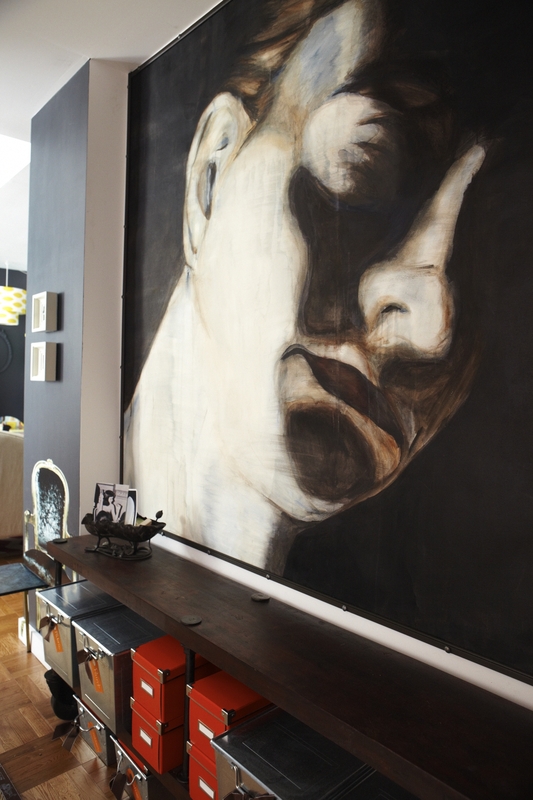 That is exactly what I did in this apartment I designed for a friend in Manhattan working with the tightest budget. Benjamin Moore’s Pink Corsage gave this room the most dramatic impact for the dollar—the best investment yet in my design portfolio. The moment this paint went on the wall I knew it was perfect and even when the light changes during the day, this shade of pink stays true and never becomes harsh or jarring to the senses. And maybe, more importantly, it casts a flattering hue on everyone’s complexion. Here’s a tip: buy the Pink Corsage in the Aura blend, which is one of Benjamin Moore’s richest, premium performance formulas of paint. You’ll get an intensity of color in one or two coats. I like thinking of this shade of pink as a neutral because so many colors look fabulous with it: brown, gray, yellow, green, blue, red, purple, silver. Think pink! I thought if a picture is worth a thousand words than magnified 5-10 times would be that much better, right? 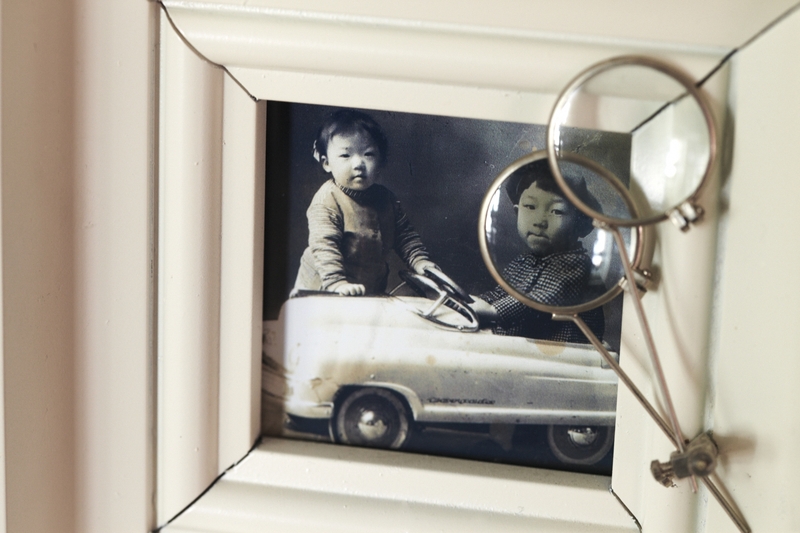 This idea was inspired by two treasured photos of my older brother and sister in Korea from the 1950s, but the original copies are very small. They only measure about 3×4” so I decided to attach a magnifying glass on the outside of the frame to help illuminate the finer details of the photo. I thought it would also make the photo viewing experience interactive and more intimate. I found these bi-focal lenses and screwed them into an inexpensive frame I found at a close-out store. The frame cost $7.99 and the bi-focal lenses were $2.50 for the pair. They easily adjust up and down to view different angles of the photo. You can also find vintage optical loops at thepaperfleamarket.com for $3.00 each. 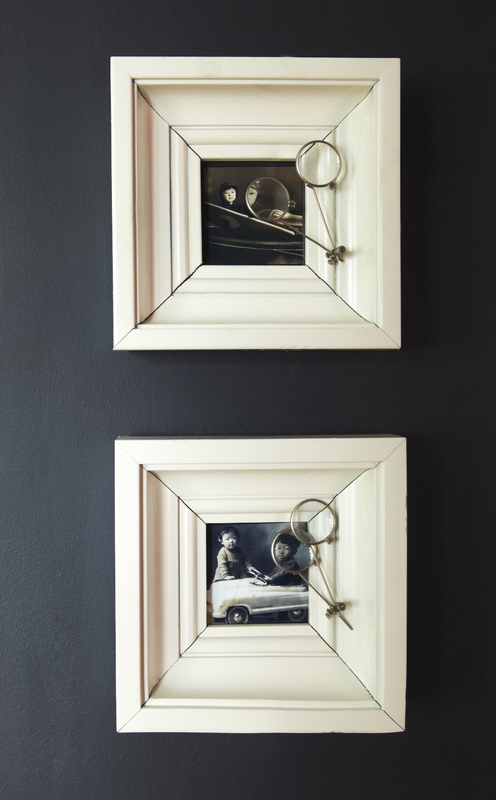 Because the optical loops don’t come with a screw, just hang those from a thin black grosgrain ribbon affixed by a decorative tack across the top front of your frame for a truly personal touch to your home. These frames really make wonderful gifts for someone special in your life. I love to mix it up when it comes to different design styles in a space especially when it’s shy of vital square footage. A little vintage here, a smidge of art deco there keeps the eye entertained and diverts attention away from a room’s shortcomings. 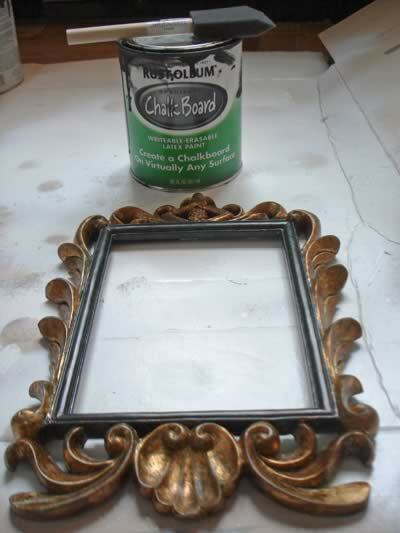 I searched everywhere for an inexpensive rococo style frame with lots of curly shapes and dramatic molding, but they were just too much for what I wanted to spend so I found an easy way to make my own. 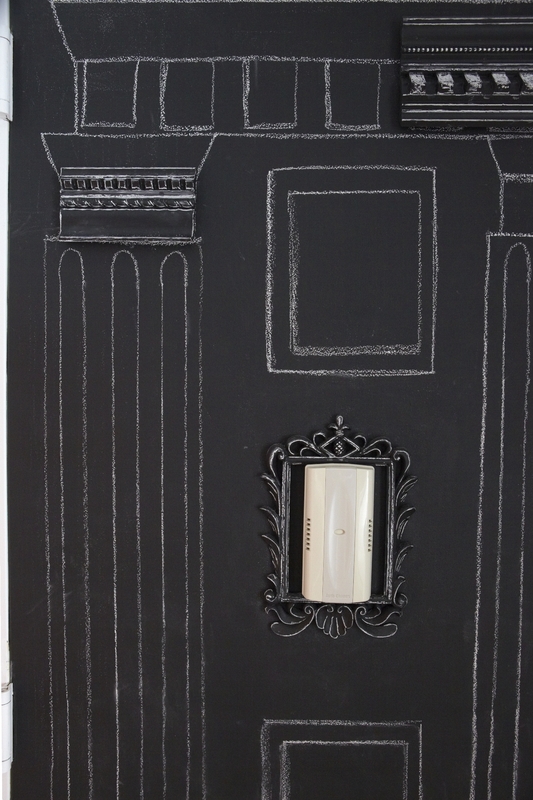 I found a plain white, flat frame and ordered pieces of decorative molding from wishIhadthat.com. Each piece cost between $2.50-3.50. I used hot glue to attach the molding in place. Then I used papier-mache (my favorite is Celluclay that you mix with water) and filled in all of the empty spaces between the molding. After that dried, I applied a skim coat of a product called Paperclay. 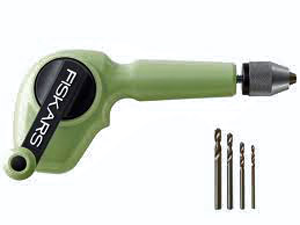 It’s a smoother air-drying clay that will give the frame a more finished look. 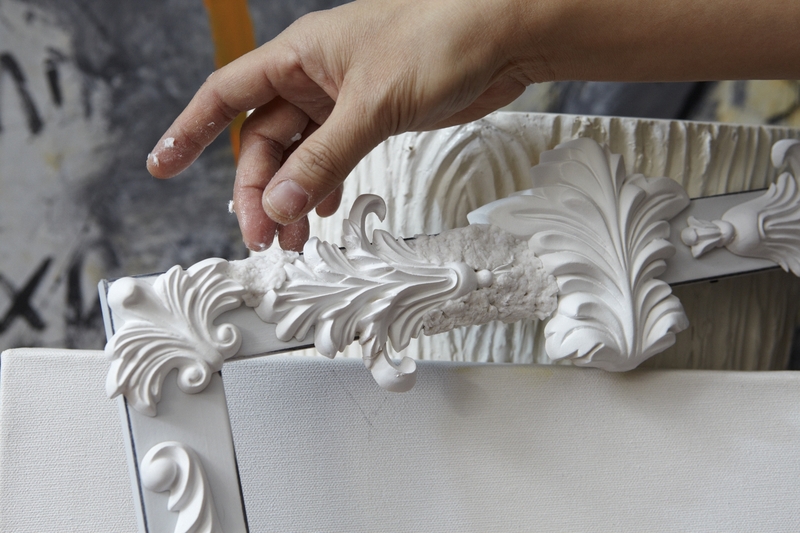 Let that dry one or two days and then paint on two layers of gesso and finish with two layers of white paint. I know it may sound like a tedious process, but it really is kind of therapeutic and the result is so satisfying. 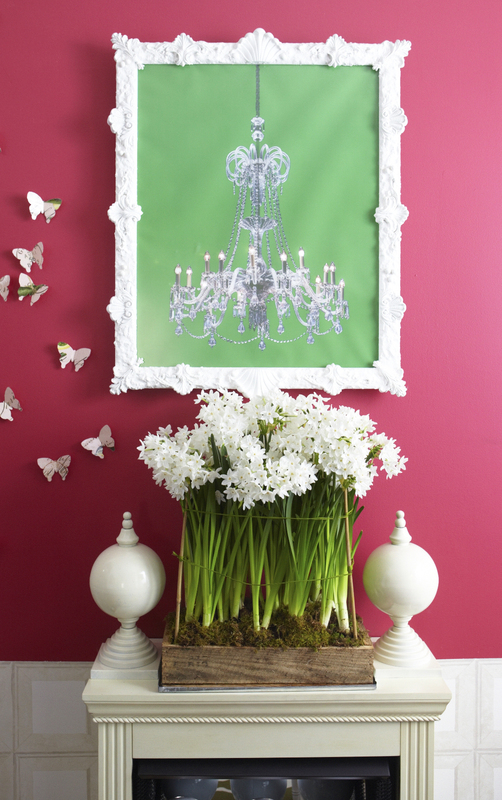 Use your new frame around a mirror to make any hallway or bedroom look important. 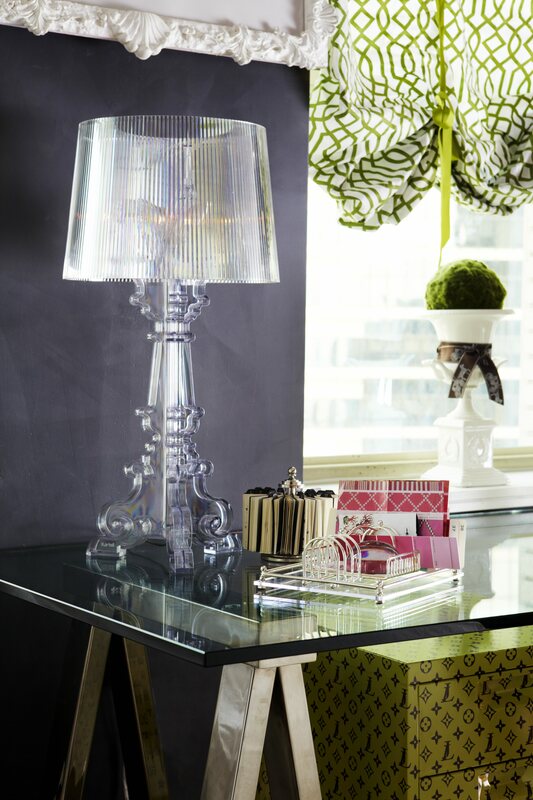 It will make you go absolutely cuckoo for rococo! Watch CBS clip. Lately, I’ve been trying to challenge myself to adopt a “use what you have” approach to decorating projects in my apartment. Over time, I’ve accumulated a ragtag collection of picture frames in my closet; many left over from design attempts gone awry. Oops! I was dying to put them to good use on the gray living room wall. 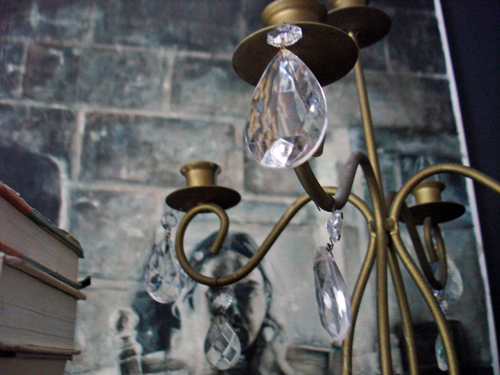 I decided to keep the look monochromatic by painting the frames with the same Benjamin Moore’s Wrought Iron gray color but for extra pop, used it in a high-gloss finish. Displayed as a large collection on the wall, these picture frames add a sense of architectural interest and depth to the overall space. Give it a whirl! I love the look and drape of a balloon window shade, but when you live in a rental you don’t want to spend a lot on curtains if you know you’ll just move to a new space with completely different window requirements. 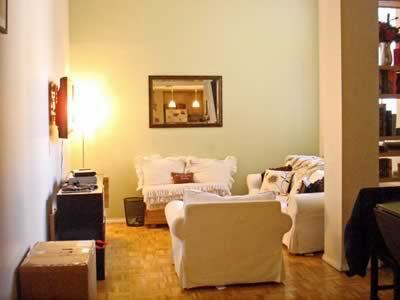 My solution was to create fabric shades out of inexpensive fitted-sheets for my current small digs. 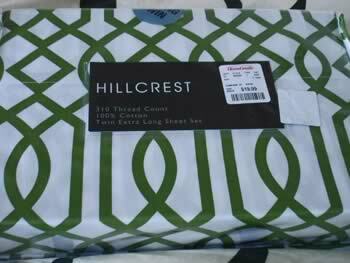 I bought two sheet sets at Home Goods for $19.99 with the perfect green trellis design I was looking for. I couldn’t believe my luck! Measure your windows. Mine are 70” tall x 41” wide. One fitted- twin sheet is about 80” long and 40” wide so I used one fitted-sheet per window. A queen fitted-sheet measures about 80” long and 60” wide. You can usually get two window shades out of one fitted-queen. 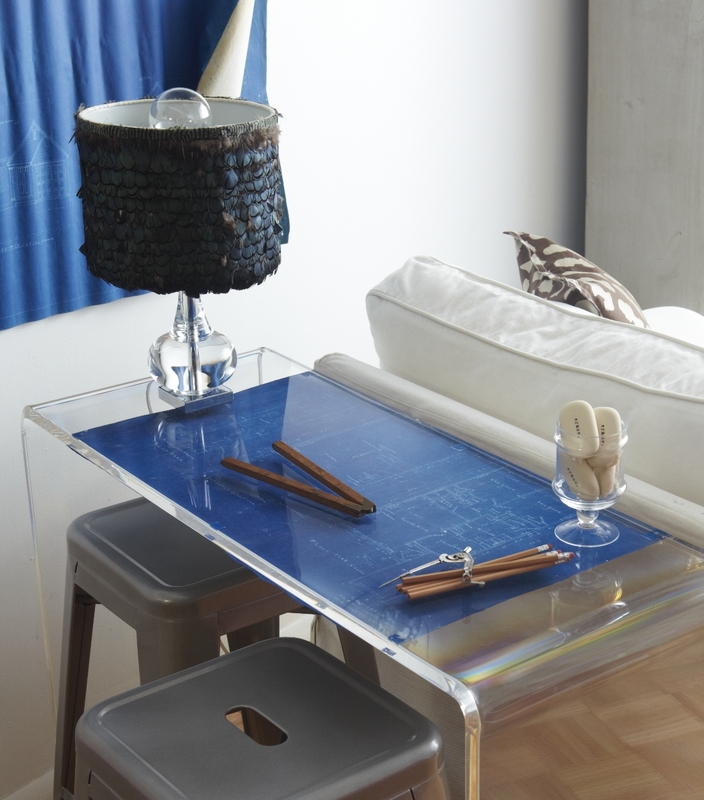 Cut off the top of the sheet and sew a finished hem leaving room for the curtain rod. 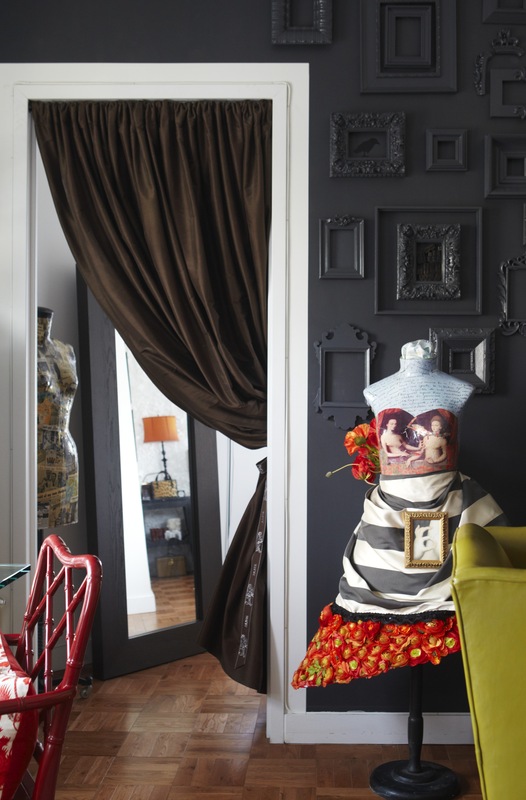 I used two rows of green grosgrain ribbon for each shade to tie it all together. I am just crazy about the finished look. 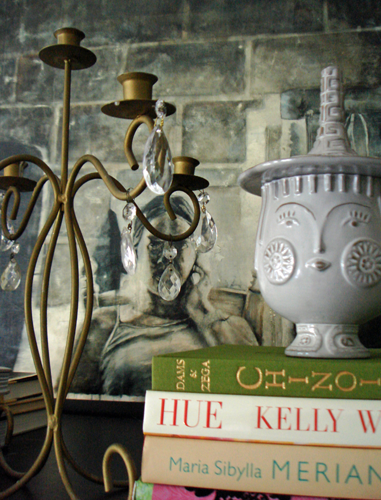 Chic, cheap and cheerful! I had no idea custom framing was so expensive until I needed a frame for a very large watercolor painting that I bought and love. When the frame options were going to cost more than the art itself I had to hit the pavement in search of a better solution. I’m thrilled to say I didn’t have to look any further than my local hardware store. 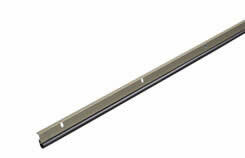 I bought aluminum and vinyl door jamb (yes, with a “b”) weather-stripping. The weather-stripping came in a set of three. Two strips measured 84” long and a shorter strip was 36” long. The price was about $15.00. 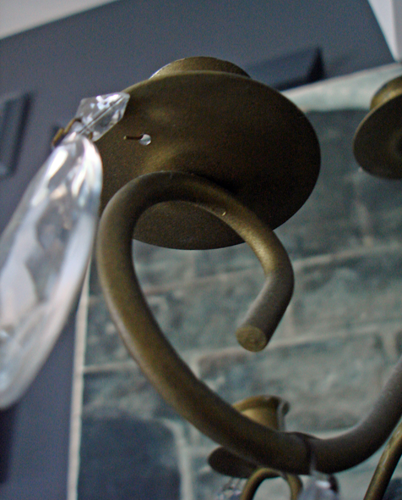 There are so many different finishes to choose from to match your art like white, nickel, silver, gold, and bronze which is what I decided to go with. My hardware store cut the pieces exactly to the measurements I needed for $5.00 extra and they did it while I waited. Each strip has pre-drilled nail holes so I used extra large upholstery tacks (5/8” wide) in a brushed nickel finish to give my art frame that industrial look. For a package of 500 tacks be prepared to spend about $46.00. You have to buy them in bulk, but I end up using them for so many different projects so it’s worth it. What can I say…it’s frame-tastic and I came in way under budget! Hard to believe iconic beauty, Audrey Hepburn, was teased as a young girl for being tall, lanky and having large eyes. 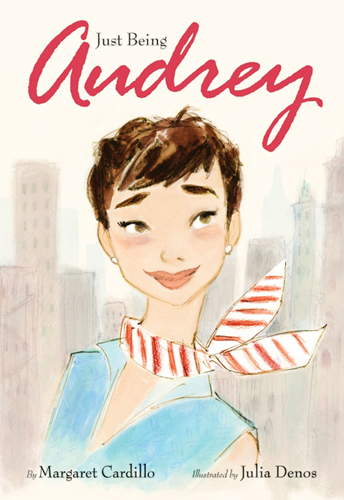 When I picked up this book, Being Audrey, I fell in love with each illustration and cannot wait to frame some of the images in a little girl’s room…especially the one with Audrey and her dog. 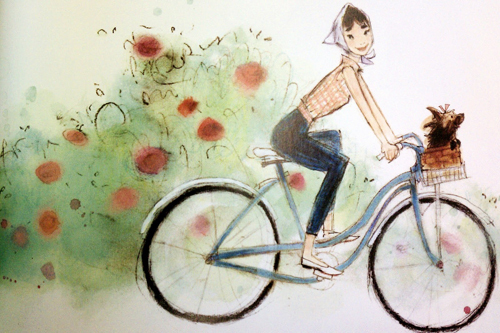 Children will be inspired by reading the story of Audrey’s life illustrated in watercolor. 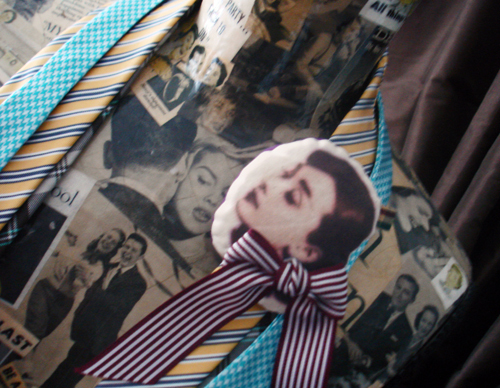 The handcrafted Audrey pin I recently bought in Korea is a reminder that she was beloved all over the world. You can get the same look by printing a favorite Audrey image onto a fabric transfer sheet. Iron on the transfer onto silk or cotton and sew it into a small pillow pin.